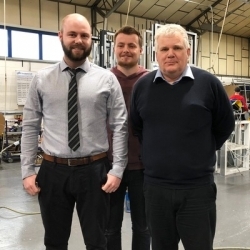 Following a successful year for the business, respected aluminium window and door fabricator CDW Systems has completed a hat trick of new appointments. Against a backdrop of extremely challenging recruitment conditions within the industry, to engage not one but three key staff is an enviable result. Strengthening CDW’s estimating team, Graeme Purves joins the Gloucester firm as an additional Sales Estimator. He brings with him a wealth of experience with over 20 years in the industry working with prominent aluminium window and door fabricators. Graeme also spent over 13 years in the Army serving with The Royal Signals in Germany and on tours of the Falklands, Cyprus and Turkey. Also new to the team is Ben Callaghan who takes up the role of Sales Order Processor to bolster the Processing Department. Joining from the automotive industry, Ben will work alongside CDW’s busy sales team to ensure that customer orders are processed correctly and efficiently. As CDW introduces a number of new product lines such as the Smart VS600 and the Reynaers CS77 door, Ben will play a vital role in maintaining CDW’s renowned service and technical support. Last, but not least, CDW welcomes Steve Davies to the team as their Account Administrator. After almost a decade in the hospitality and leisure sector in Gloucestershire and Worcestershire, Steve brings his expertise in accounting and financial management to the specialist aluminium fabricator. “All three recruits are incredibly talented and bring with them decades of experience which will undoubtedly strengthen our operation and help deliver an even better service to our valued trade and commercial customers,” remarks Angela. Founded in 1992, CDW Systems has firmly established itself as one of the UK’s leading manufacturers and suppliers of high-quality aluminium products. Supplying both the trade and commercial installation companies across the UK, CDW manufactures windows, doors, shop front systems and curtain walling from leading systems houses including Sapa (part of the Hydro Group), Reynaers, ALUK and Smart Systems.